Pubilc Key Encrytion with Keyword Search (PEKS) scheme allows users to search encrypted messages by using a particular keyword without leaking any information. Practically, users might need to relate multiple keywords to one message. To effectively encrypt multiple keywords, Baek et al. first presented a PEKS scheme with multiple keywords (MPEKS). 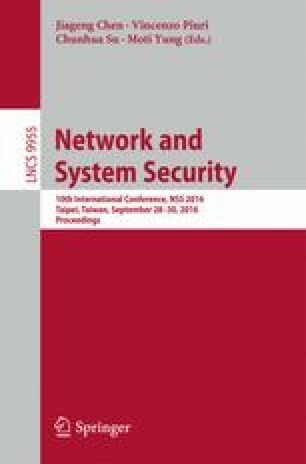 In this paper, we come up with a new efficient secure channel free PEKS scheme with multiple keywords named SCF-MPEKS. We give formal definitions and a concrete construction of SCF-MPEKS. The proposed SCF-MPEKS scheme is secure in the presented models of indistinguishability for SCF-MPEKS. Our scheme removes the secure channel assumption between the server and the receiver, which has much better performance in terms of both computational and communication overhead than Baek et al.’s MPEKS scheme for building a secure channel is very costly. This work is supported by National Natural Science Foundation of China (61472083, 61402110), Program for New Century Excellent Talents in Fujian University (JA14067), Distinguished Young Scholars Fund of Fujian (2016J06013) and Fujian Normal University Innovative Research Team (IRTL1207).